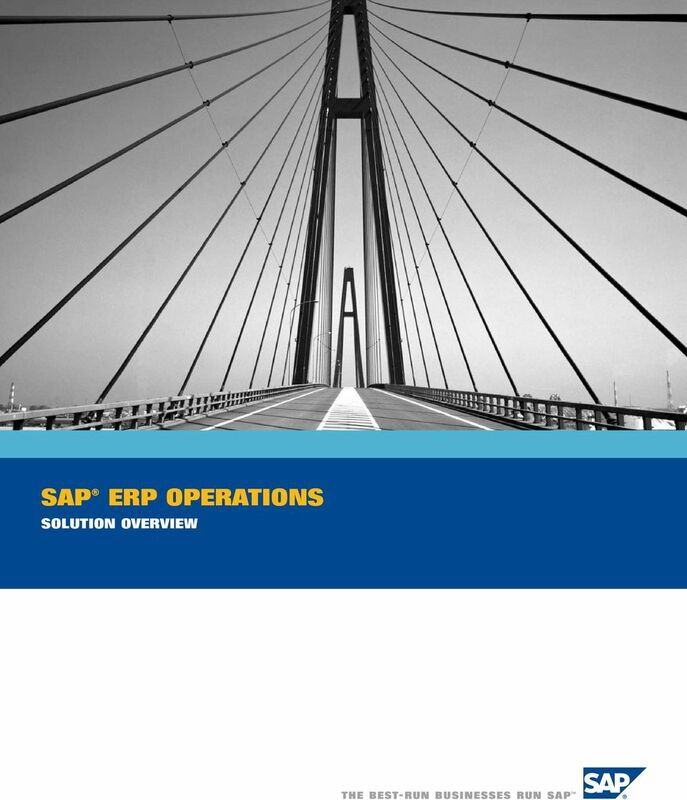 Download "SAP ERP OPERATIONS SOLUTION OVERVIEW"
2 YOUR SUCCESS Solving business problems is the general criterion for measuring success... SAP provides us with the powerful tools we need to solve our business problems. Michael Huang, Director of the Information Center, Great Wall Broadband Network Service Co. Ltd.
3 ... 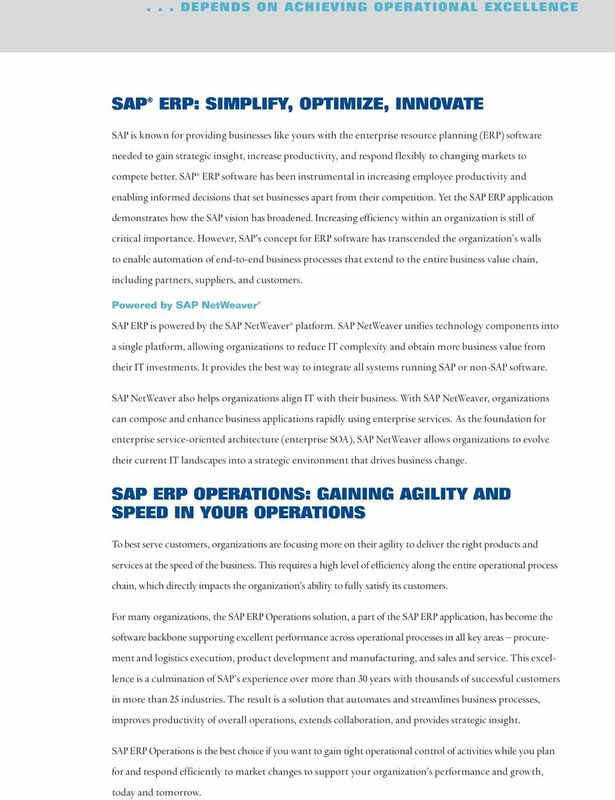 DEPENDS ON ACHIEVING OPERATIONAL EXCELLENCE SAP ERP: SIMPLIFY, OPTIMIZE, INNOVATE SAP is known for providing businesses like yours with the enterprise resource planning (ERP) software needed to gain strategic insight, increase productivity, and respond flexibly to changing markets to compete better. SAP ERP software has been instrumental in increasing employee productivity and enabling informed decisions that set businesses apart from their competition. Yet the SAP ERP application demonstrates how the SAP vision has broadened. Increasing efficiency within an organization is still of critical importance. 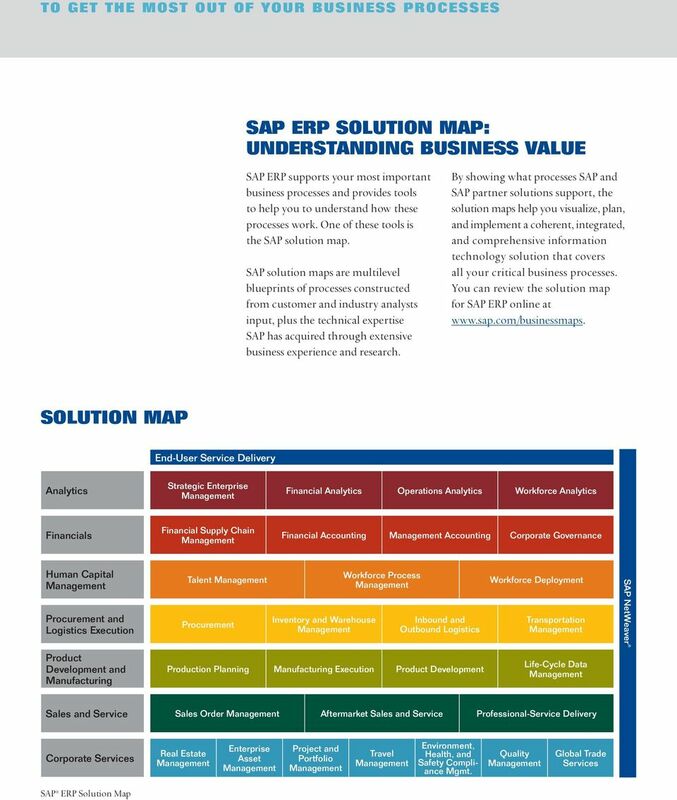 However, SAP s concept for ERP software has transcended the organization s walls to enable automation of end-to-end business processes that extend to the entire business value chain, including partners, suppliers, and customers. Powered by SAP NetWeaver SAP ERP is powered by the SAP NetWeaver platform. SAP NetWeaver unifies technology components into a single platform, allowing organizations to reduce IT complexity and obtain more business value from their IT investments. It provides the best way to integrate all systems running SAP or non-sap software. SAP NetWeaver also helps organizations align IT with their business. With SAP NetWeaver, organizations can compose and enhance business applications rapidly using enterprise services. As the foundation for enterprise service-oriented architecture (enterprise SOA), SAP NetWeaver allows organizations to evolve their current IT landscapes into a strategic environment that drives business change. SAP ERP OPERATIONS: GAINING AGILITY AND SPEED IN YOUR OPERATIONS To best serve customers, organizations are focusing more on their agility to deliver the right products and services at the speed of the business. This requires a high level of efficiency along the entire operational process chain, which directly impacts the organization s ability to fully satisfy its customers. 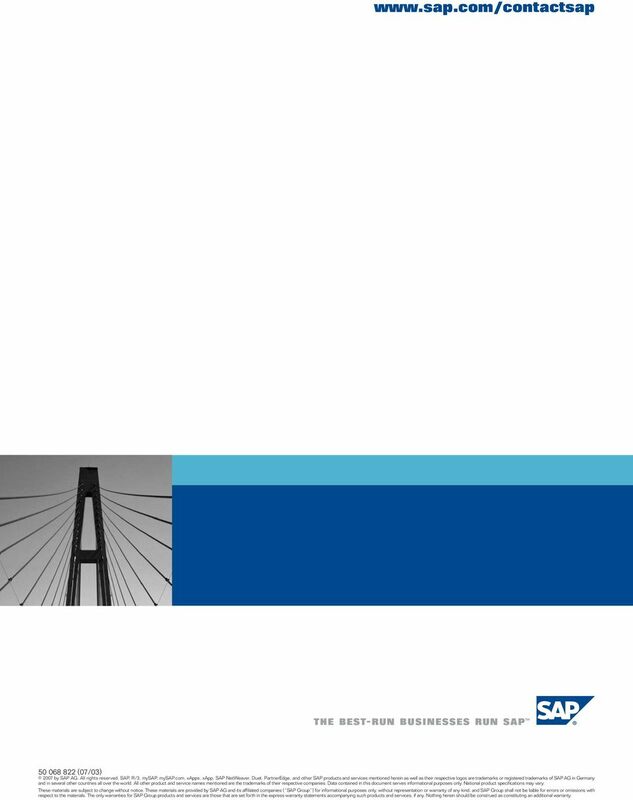 For many organizations, the SAP ERP Operations solution, a part of the SAP ERP application, has become the software backbone supporting excellent performance across operational processes in all key areas procurement and logistics execution, product development and manufacturing, and sales and service. This excellence is a culmination of SAP s experience over more than 30 years with thousands of successful customers in more than 25 industries. The result is a solution that automates and streamlines business processes, improves productivity of overall operations, extends collaboration, and provides strategic insight. SAP ERP Operations is the best choice if you want to gain tight operational control of activities while you plan for and respond efficiently to market changes to support your organization s performance and growth, today and tomorrow. 4 YOU NEED TO SATISFY YOUR CUSTOMERS CUSTOMERS ARE YOUR REASON FOR DOING SO WHY NOT DO THINGS DIFFERENTLY AND MORE EFFICIENTLY To best satisfy customers you must be able to provide the right product or service at the right price to the right customer at the right time. In order to achieve this goal, you need to ensure the integration of the entire chain including design, development, procurement, manufacturing, and sales, until the delivery of your products and services. But you also need the flexibility to simplify, automate, and innovate your processes in order to support new business requirements. In other words, to best serve customers, you need to achieve operational excellence. Operational excellence is the ability of an organization to achieve a high level of customer service while reducing operating costs at the same time. An organization can then run its business at the speed of change with more agility, from its suppliers to its customers, no matter what changes occur in the market and in demand. With complete support for procurement and logistics execution, organizations can manage end-to-end procurement processes and logistics business processes for complete business cycles, from self-service requisitioning to flexible invoicing and payment, as well as optimize the physical flow of materials. Product development and manufacturing functionality covers end-to-end processes from the engineering and design of products to the planning and execution of manufacturing operations in a wide variety of industries. These processes include creating relevant product data, maintaining connectivity to shop-floor systems, and complying with relevant regulations and standards. 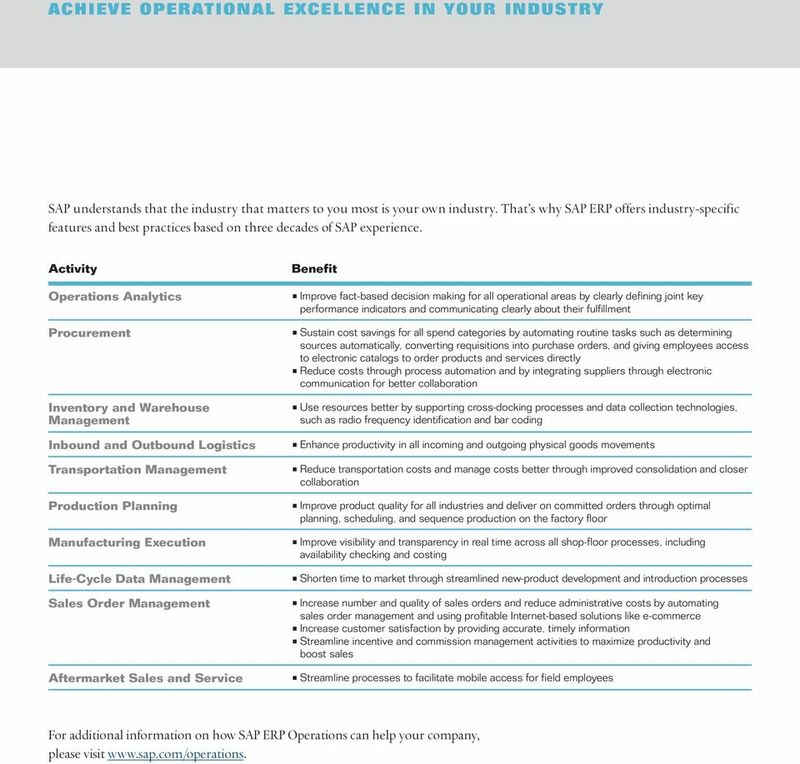 SAP ERP offers an extensive solution to help you achieve operational excellence. Its innovative process-driven approach is in line with your value chains for procurement and logistics execution, product development and manufacturing, and sales and service. Sales and service functionality addresses customer-focused processes, from selling products and professional services to providing aftermarket processing of warranty claims, service orders, and returns. It also supports the calculation of incentives and commissions. In addition, the solution provides powerful analytics for better decision making through innovative and personalized role-based self-services. 6 YOU NEED THE RIGHT SOLUTION DELIVER THE RIGHT PRODUCT AT THE RIGHT PRICE TO THE RIGHT CUSTOMER AT THE RIGHT TIME SAP ERP Operations allows you to plan and execute your operations in a way to drive efficiency that benefits the entire value chain. Automate and Streamline Business Processes with Greater Adaptability Match overall supply with demand. Align the entire enterprise with your key business processes in design, development, procurement, manufacturing, sales, and delivery. Adapt quickly based on real-time information. Manage all resources and assets along the entire value chain. Become a learning organization learning from exceptions and incorporating hard-won, practical knowledge into existing and new business processes. operational processes. Catalyze informed decision making. Capitalize on flexible customization to personalize your portals to meet the specific needs of business users. Manage centrally your critical documents bills of material, routing data, computer-aided design models, recipes, project plans, and parts information. 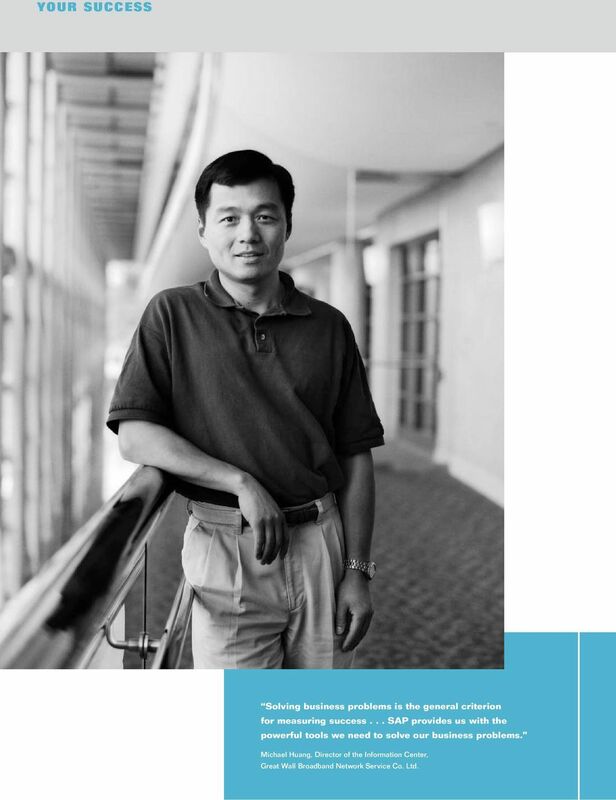 Enjoy direct access to information while reducing data maintenance efforts. Extend Collaboration to All Value Chain Partners Enhance collaboration among departments, customers, suppliers, and business partners and see a significant improvement in your entire supply chain. Integrate partners of all sizes to release data throughout the chain that s accurate, complete, and available up to the minute. 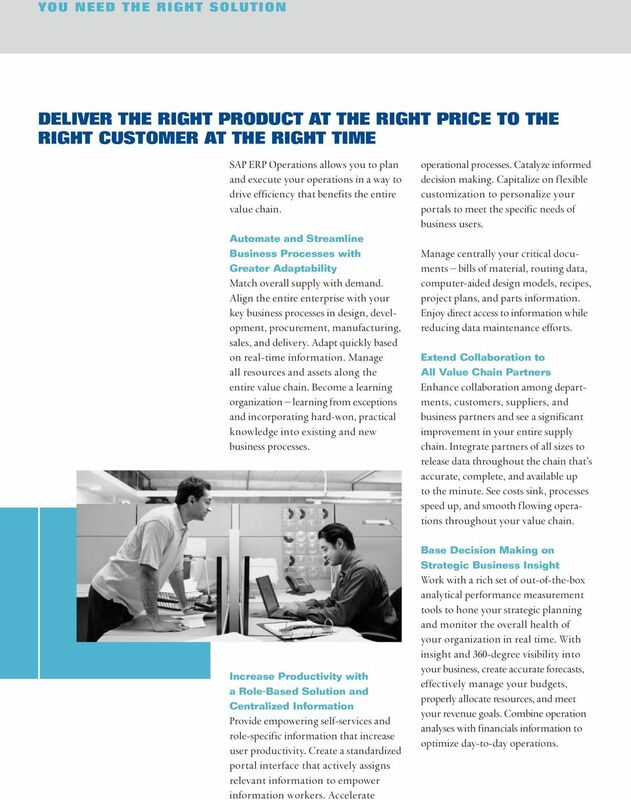 See costs sink, processes speed up, and smooth flowing operations throughout your value chain. Increase Productivity with a Role-Based Solution and Centralized Information Provide empowering self-services and role-specific information that increase user productivity. Create a standardized portal interface that actively assigns relevant information to empower information workers. Accelerate Base Decision Making on Strategic Business Insight Work with a rich set of out-of-the-box analytical performance measurement tools to hone your strategic planning and monitor the overall health of your organization in real time. With insight and 360-degree visibility into your business, create accurate forecasts, effectively manage your budgets, properly allocate resources, and meet your revenue goals. Combine operation analyses with financials information to optimize day-to-day operations. 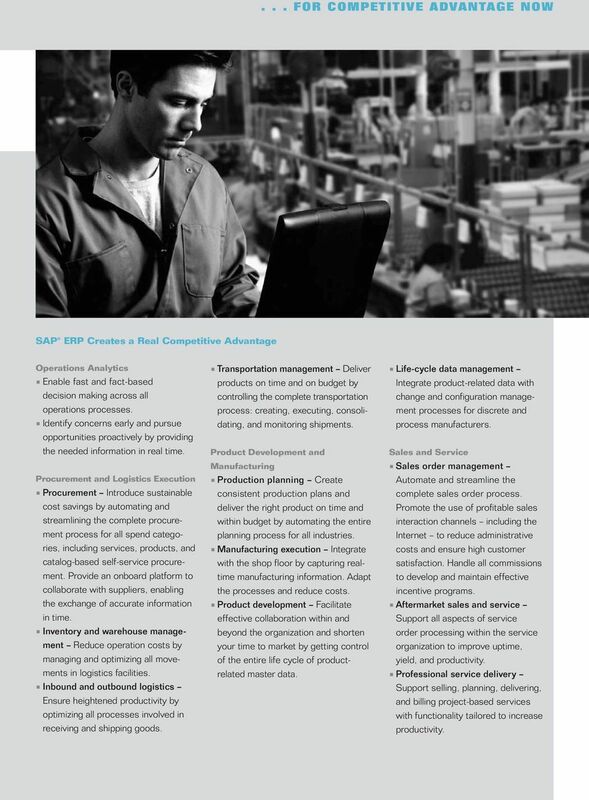 7 ... FOR COMPETITIVE ADVANTAGE NOW SAP ERP Creates a Real Competitive Advantage Operations Analytics Enable fast and fact-based decision making across all operations processes. Identify concerns early and pursue opportunities proactively by providing the needed information in real time. Procurement and Logistics Execution Procurement Introduce sustainable cost savings by automating and streamlining the complete procurement process for all spend categories, including services, products, and catalog-based self-service procurement. Provide an onboard platform to collaborate with suppliers, enabling the exchange of accurate information in time. Inventory and warehouse management Reduce operation costs by managing and optimizing all movements in logistics facilities. Inbound and outbound logistics Ensure heightened productivity by optimizing all processes involved in receiving and shipping goods. Transportation management Deliver products on time and on budget by controlling the complete transportation process: creating, executing, consolidating, and monitoring shipments. Product Development and Manufacturing Production planning Create consistent production plans and deliver the right product on time and within budget by automating the entire planning process for all industries. Manufacturing execution Integrate with the shop floor by capturing realtime manufacturing information. 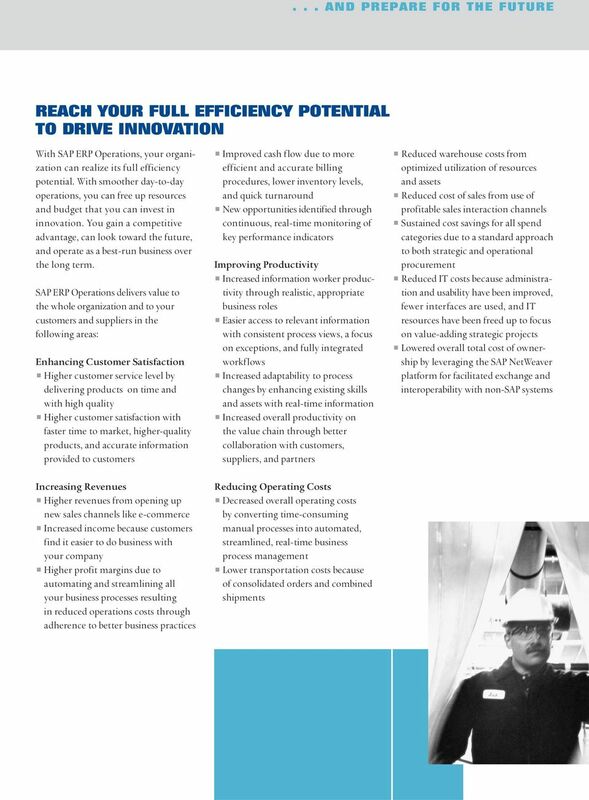 Adapt the processes and reduce costs. Product development Facilitate effective collaboration within and beyond the organization and shorten your time to market by getting control of the entire life cycle of productrelated master data. 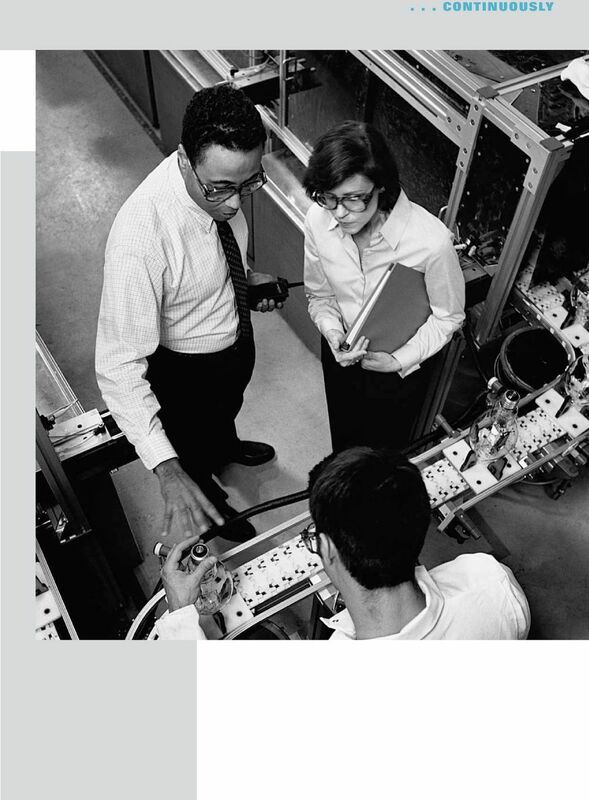 Life-cycle data management Integrate product-related data with change and configuration management processes for discrete and process manufacturers. Sales and Service Sales order management Automate and streamline the complete sales order process. Promote the use of profitable sales interaction channels including the Internet to reduce administrative costs and ensure high customer satisfaction. Handle all commissions to develop and maintain effective incentive programs. 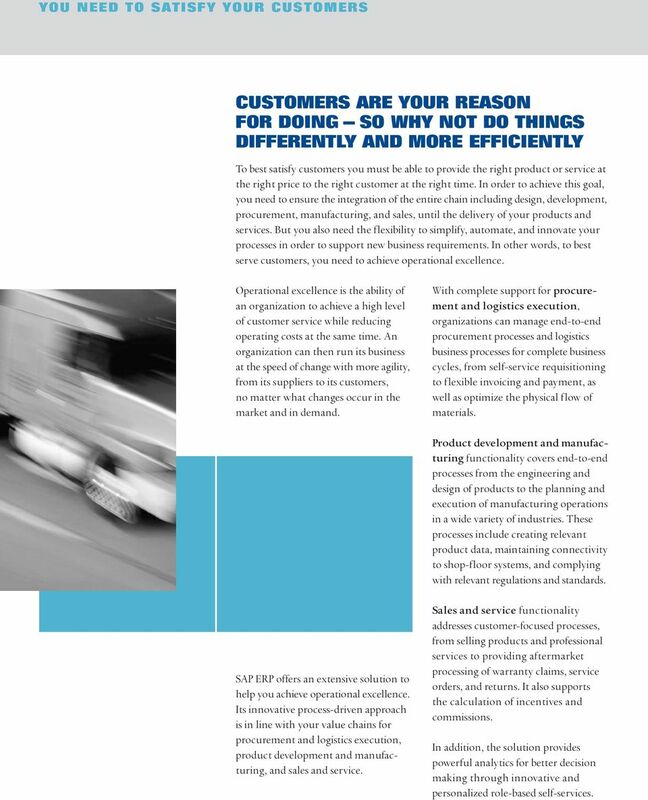 Aftermarket sales and service Support all aspects of service order processing within the service organization to improve uptime, yield, and productivity. Professional service delivery Support selling, planning, delivering, and billing project-based services with functionality tailored to increase productivity. 12 (07/03) 2007 by SAP AG. All rights reserved. SAP, R/3, mysap, mysap.com, xapps, xapp, SAP NetWeaver, Duet, PartnerEdge, and other SAP products and services mentioned herein as well as their respective logos are trademarks or registered trademarks of SAP AG in Germany and in several other countries all over the world. All other product and service names mentioned are the trademarks of their respective companies. Data contained in this document serves informational purposes only. National product specifi cations may vary. These materials are subject to change without notice. These materials are provided by SAP AG and its affi liated companies ( SAP Group ) for informational purposes only, without representation or warranty of any kind, and SAP Group shall not be liable for errors or omissions with respect to the materials. The only warranties for SAP Group products and services are those that are set forth in the express warranty statements accompanying such products and services, if any. Nothing herein should be construed as constituting an additional warranty.